Here are some of the issues that combine my favorite stories and my favorite covers from the series. And I guess I should say "Spoiler Alert" as I briefly summarize what happens in the issue. If you haven't read this in the past 20 years, you really don't have a right to complain! Of all the Spider-Man villains, I can't think of one that had more character development over the years than Kraven The Hunter. 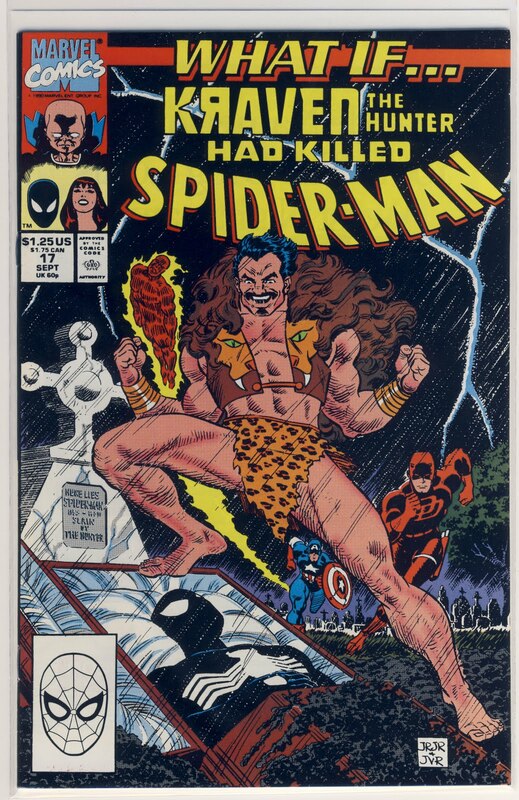 You just don’t have many character in comic books in the 80’s committing suicide and the events culminating to that [as told in the Kraven's Last Hunt storyline] are one of the best Spidey stories ever. 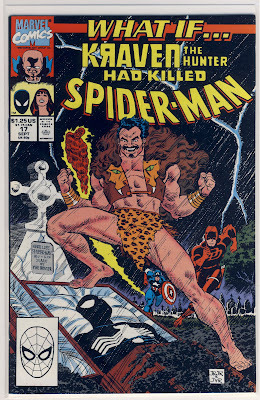 The What If... story in this issue re-imagines that Kraven uses real bullets to shot Spider-man to capture him rather than a tranquilizer dart and so Kraven takes over Spider-Man's role for good. In issue #2 The Daredevil kills the Kingpin. If you are a Daredevil fan or followed this original story, this is a What If...that you might actually wished had happened. 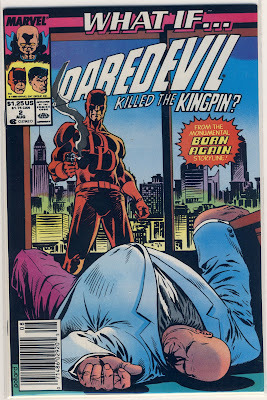 But once Daredevil kills the Kingpin, things go bad very quickly. Matt Murdock falls in a deep depression about what he has done and the city is being torn apart with gangs fighting to take over the Kingpin's turf. The Rose, [who is the Kingpin's son] plots revenge on the Daredevil but ultimately forgives him after he saves the Rose from The Hobgoblin. Daredevil is killed in the fight and the Rose becomes the new Daredevil. The Holy Grail of my local shop is the side wall where issues #1-18 of the original Silver Surfer sit on a shelf taunting any fan of the savior of the planet Zenn-La. I actually got my fiance to come in with me one of the last times I stopped by and I jokingly/deadly serious said "that would be a good Christmas idea for me." I told her what exactly we were looking at and why it was turned to 11 awesome and the woman [who as best I can tell is the daughter of the owner of the shop] mentioned that the collection was only $1500. Laura looks at comics the way that I look at purses...as a giant waste of money, so her mouth nearly hit the floor when the price was given. 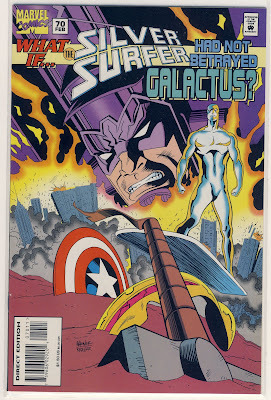 In this What If... story The Silver Surfer never betrays his master, Galactus, when Galactus comes to Earth to eat it. Yes, I said eat it. 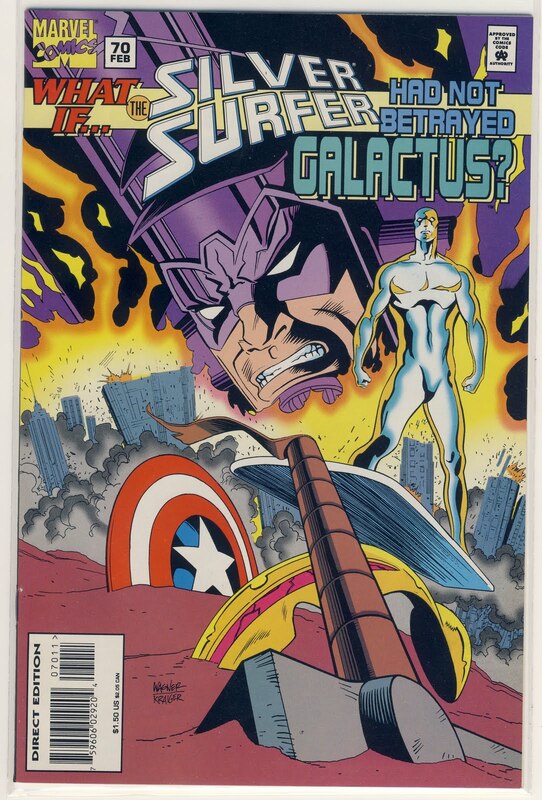 The Fantastic Four are easily defeated by the Surfer and then the Avengers try to battle Galactus with the Surfer killing Iron Man and Thor and Galactus making short work of Captain America. Eventually, Dr. Doom and Silver Surfer battle and sort of blow each other up in a supernova and the Fantastic 4 impress Galactus with their bravery when they try to orchestrate a surprise attack on his ship. In the end, The Fly and Alicia Masters take over the Silver Surfer's role at Galactus' herald.